Free Spirit Spheres are set among the tall trees of the west coast rainforest of Vancouver Island, Canada. We invite you to experience a tree house for adults. Built on vision and engineering these handcrafted spheres are suspended like pendants from a web of rope. They occupy a truly unique place in the world while providing a habitat for the un-tamed spirit that exists in us all. If it suits your un-tamed spirit you may wish to purchase a sphere or components to build your own. Uses for these spheres are limited only by ones imagination. Healing, meditation, photography, canopy research, leisure and game watching are just some of the things you can do. 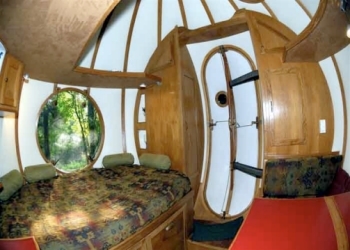 Spheres, Eve, Eryn and Melody, are available for overnight rental. We are approximately 30km north of Parksville on Vancouver Island along the Inland Island Hwy (#19), near Qualicum Bay. The acreage is on private property close to Horne Lake Caves, Georgia Strait and Mount Washington. Come experience an enchanted coastal rain forest.... your comfortable, gently swaying, restful sphere awaits. 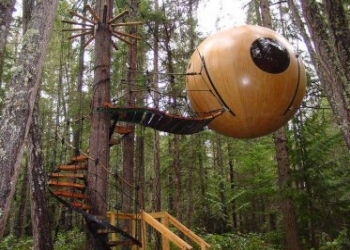 The "Spherical Tree House" concept borrows heavily from sailboat construction and rigging practice. It's a marriage of tree house and sailboat technology. Wooden spheres are built much like a cedar strip canoe or kayak. Suspension points are similar to the chain plate attachments on a sailboat. Stairways hang from a tree much like a sailboat shroud hangs from the mast. Spherical architecture has many unconventional features. Conventional buildings separate walls, ceiling and floor with hard lines. In a sphere the walls and ceiling merge into one. The function changes but the form remains the same. It is a unified structure with one continuous wall. I call this uniwall construction. There are only 2 sides to a sphere, inside and outside.